Sheri and I recently met with staff at the Plains Art Museum in Fargo and discovered what a treasure the museum is for the whole region. This ceramic art piece looks like it could go in the recycle bin! The Plains Art Museum is the largest art museum in the Dakotas and western Minnesota. In fact, it is the largest between Minneapolis and Denver! They bring arts programming throughout the region and provide exhibiting opportunities for our area artists. One interesting exhibit on display through January is called “A Place at the Table.” Area artists who are members of an area contemporary clay community, challenge themselves with an art theme each year. This year’s challenge was to create a set of tableware…think plates, dishes, coffee cups, bowls. 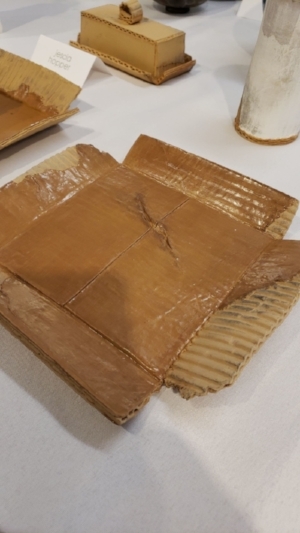 My favorite was a unusually-realistic dinnerware set that you swore was real cardboard (see photo). The museum folks we met with talked about the museum took over an old warehouse-type building in a not-so-great part of the city of Fargo. Now that area is a destination with plenty of places to eat; and you may have noticed that in the Blog page we featured Sheri starting to enjoy a sandwich from the Wurst restaurant a block away. I’ve written before about the importance of arts as a building block for economic development, but another factor are the amenities that are available in nearby cities. The art museum is an example of that, a place to visit, to bring guests, in a “field trip” sort of activity. And talk about outreach. They have donors help pay for bus costs to bring schoolchildren for art activities. They have classes from youth to elder adults. They host a multitude of special events such as wedding receptions. A museum that can function as an event and education center is a place that will thrive for years to come. 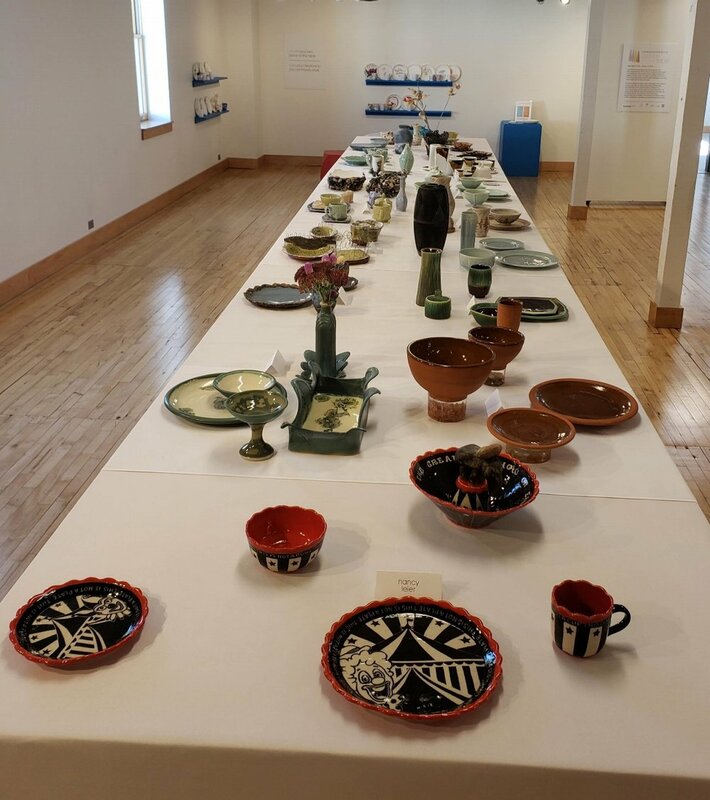 This ceramic pottery display featuring table place settings can be viewed through January, 2019.